Have you found an online vendor selling Mezan XO Jamaica? I think I may have come across another brand to really enjoy to go along with Plantation and Clement. 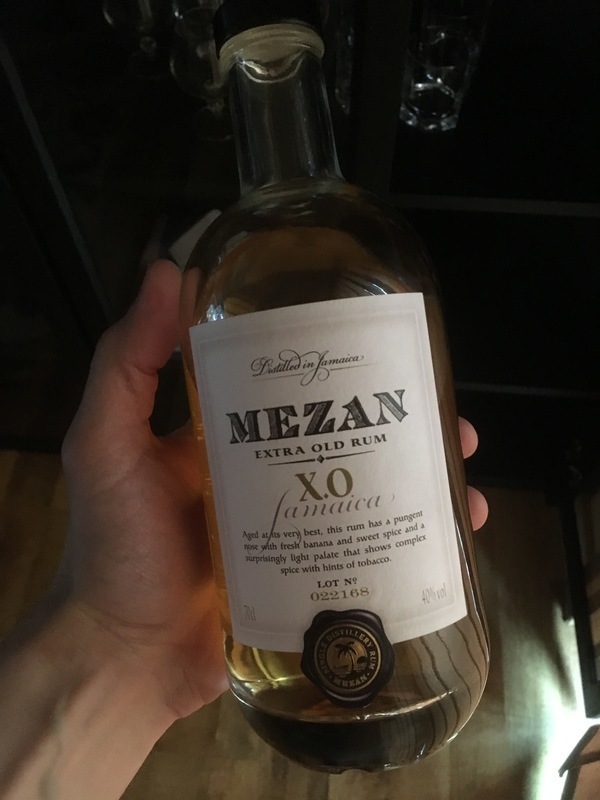 According to the label, this rum (and I assume based upon their website all Mezan rums) is "unblended, unsweetened, uncolored, and only lightly filtered". In the bottle and in my snifter this rum is a light yellow hue reminding me of something I dare not mention here (TMI). It has a very nice aroma and good legs. This is small batch rum with only 5000 bottles produced. One they are gone, they are gone for good. My bottle is labeled as coming from batch number 008146. According to online sources this rum is a blend from two distilleries in Jamaica: Monymusk and Hampden. Then the rum blend is re-aged (whatever that is) in used bourbon barrels. The flavor is quite interesting. There is an initial sweetness to it that is subtle but the aging in bourbon barrels bring about a noticeable oakiness to it. I get some vanilla and banana (?) mixed in. There is a nice warmth to it...not really a burn. And the finish is somewhat dry with the oak tannins present. No two ways about it...this is a sipping rum par excellence. It would be a crime to use this in mixed drinks. Maybe a little water on one cube of ice to bring out the subtleties but that's it. This is a very smooth rum. Mezan calls itself "The Untouched Rum" which means no added sugar, no added colouring (like caramel) and only a light filtering. The Jamaican XO is the only rum that's currently permanently in their portfolio (others are single years vintages). It's a blend of selected casks from different Jamaican distilleries aged between 4 and 23 years and reaged after blending until deemed ready for bottling. Mezan do not put an age statement on their rums and rightly so. It's about creating a consistent flavor profile year in year out, in order to achieve this the actual age fluctuates. I wish more rums would abandon age statements, seeing as they are often misleading and little more than a marketing thing. Taste is what matters, not numbers. And this is tasty! Smelly too. Lots of overripe banana, as can be expected from a Jamaican pot still rum. Some caramel scent too, giving the impression of bannofee pie. Taste is less sweet than expected based on the aroma. Very light body, very smooth, no burn. Quite a lot of oak, you can taste this has some age. Finish is quite dry and medium long. All in all I'd have preferred a slightly fuller body and some bolder flavours, but this is a very pleasant effort nonetheless by an sympathetic brand. Lots of ripe banana and just a hint of grassyness. Smells like maybe overripe pineapple or banana skin. No added color, no Carmel, more rums need to be honest about the real color from aging and added color. One of those rums that seems more like a whisky to me. Люблю подобный дизайн бутылок - не слишком высокие, но раздутые, толстые. Сам дизайн достаточно прост, и тем самым и привлёк моё внимание. Сразу обратил внимание на пробку, она винтовая. Не слишком часто встретишь пробки с винтовые пробки уже в этой ценовой категории. Но взглянув ещё раз на общий образ бутылки и дизайна, соглашусь, что «винт» в данном случае даже более уместен. Первое - аромат. Напиток кажется очень ароматным по запаху и в уже предвкушаю его фруктовый вкус. Наливаем в бокал. Напиток достаточно светлый. Я бы сказал цвета светлого вина, по типу рислинг. Запах все ещё такой же хороший, очень приятный. Чувствуется сладость и фруктовый букет. Пробуем. Данный ром действительно очень ароматный, он определенно выделяется на фоне многих других. Достаточно сладкий, но в меру. Как по мне, то сладости ровно столько сколько нужно в нем. Но по долгу держа во рту - мне уже было не приятно. После нескольких последующих глотков пришёл к выводу, что намного приятней его сразу проглатывать, не задерживая во рту. Послевкусие очень двоякое: именно из за него я и поставил, казалось бы столь низкую оценку данному напитку. Есть ароматное послевкусие, которое ещё долго прибывает. И как мне кажется, преимущественно это не цитрус, а скорее банан, ананас. С другой стороны есть что-то не очень приятное, что остаётся в послевкусии. То же ощущение если задержать во рту напиток, не глатая сразу. Нужно попробовать его в сочетании с сигарой. I try and alternate between sweet , spiced and real rum. This is real rum , light in colour , no sugar or other additives. Not as funky on the nose as I expected , left in the glass for 10 minutes , I found banana , pineapple plus a bit of vanilla. Quite dry , lots of esters in the taste , a bit of a burn but in a nice way.. Even better with an ice cube.. Excellent rum and coke with a slice of lime.. just not too much mixer as it kills the taste. If you factor in price ( Marks & Sparks) this is great value as well as taste. Not available here in Aussie so will have to try and make the bottle last ! Oh and no headache the next morning , very important !! Real rum, no sugar, no coloring. Nice smell of original spirit with a lot of esters, just touch of the wood barrels. It's all about the spirit, this shows how the proper rum should taste. Very fruity smell and taste of banana, but not sweet, and a slight oaky essencence. All very subtle and very sympathetic to the overall taste of a rum that does not have a lot of additives. I like bananas and believe elegance often lies in simplicity. It this case it does show. One I'll definitely be looking out for in future again. Not terribly harsh, but the sweetness is weird - almost glue like. My initial thoughts were that it was clean and I understand the references to tobacco and on the swallow banana but not in an overpowering way. I tried this with cola and a slice of lime, too much coke and the unique taste is drowned but just right and you have a premium mixer. However, for myself I will generally be treating this as a sipper. There’s some alcohol burn but it’s short and adds positively to the sip. this has a strong nose, like unaged spirits over raw peeled bananas. but the taste is surprising. the rum has a strong approach when you first sip it. it gives a strong tingle and burn, like a good whiskey. the finish is very very light. often i fall for that "darker is better" with rums and then one like this comes along and I really like it. what a lovely surprise value bottle. this makes me want to try all the different mezan blends. I love this rum. The color is light which worried me when I bought it. Then I opened the bottle. The aroma is delightful. Not a strong alcohol smell like most rums have. A fruit aroma. The legs are nice and long. Now to important stuff. Taste is great. Banana hit me first. Then I got that famous Jamaican funk taste. A bottle cost me $30. Overall a great rum. My favorite blended rum. I didnt hear about this rum before I've seen it in the shop. It cost about 30$ so I decided to try. It tirned out very intresting rum with very unexpecting taste. It wasnt so heavy like classic jamaican rum but with its own "funk" taste. It excellent neat with no ice. No gimmicks, no color, no sugar. Just a pure to form Jamaican rum with a bit of age. It has an interesting leathery quality to it, and I agree with the label there is a "tobacco" note in it, like aged pipe tobacco. Spicy, rich, and finishing dry. It would be wasteful to blend this in a cocktail, instead I prefer to sip it neat. Its good and classy, no doubt, with a noticeable amount of rum oil... Its delicate nature caught me off guard, and as I cool down and sip slowly, I find more and more to appreciate. The greatest disappointment with this rum is how very mild it is. When you spend a premium price, you want a rum with lots of flavor (especially Jamaican!). 45% abv or more would have really made this rum sing, and would have justified the price of $45. My experience with Jamaican rum is fairly limited. Some of those have had the "funk" that characterizes Jamaican rums, some are just regular-tasting rums. This one is not the latter. It has that astringent, overripe fruit taste that I assume is the "funk" everyone talks about. It's there and it's noticeable. The problem is, there isn't much else in the flavor profile. So that pretty much sums it up. Still, this is a bit better than Plantation Original Dark when sipped straight. However, it is an amazing mixer! Not only does it pass the daiquiri test with flying colors, but it is a welcome addition to Coke (unlike Plantation Original Dark). I usually require a rum to be a passable sipper to garner a 7, but this one gets it strictly as a mixer. It makes for a pricey mixer, but I think it's worth it. I had higher hopes for this one given prior tastings of Mezan rums. Flavor was a bit strong, but it mixed fine with Coke. 40% ABV. Delightful nose! Funky ripe bananas and other tropical fruits. Reminds me rather of Hamilton Pot Still Jamaican. So, I'm picking up on some of the Worthy Park distillates. Medium finish. Delicious. Delightful. I do wish it was bottled at a higher proof, but really, it's super tasty as-is. Approachable yet utterly full of flavor. Cheers! It's ok. I had expected this to hit me with a smell like a force 10 gale - it didn't; I expected it to be tasty - it was so so; I expected a strong banana taste - it was there but not nearly by as much as folks say. Instead I found it another variant of fairly dry, oaky, slightly bourbon-like Jamaican rum...only it's not as good as Appleton's - and I am not a huge Appleton's fan to start with. It has a little sweetness to counter the overall dryness, but I just didn't think it was anything special and I wouldn't choose it as a sipper. Very pleasant aroma of warm wood, tobacco, fresh jam, like bajan rum. In the mouth, an amazing sweetness at first, harmonious, rounded. And yet the tongue grows numb. Woody shade. Aftertaste spoils previous impressions: burning and heaviness in the esophagus, stomach, dull head. There is no ease in the desire to continue. But the next morning will be easy and good. And I didn't find information about aging.